High-definition video has arrived -- in under-$1000 consumer camcorders, and supported by sub-$100 consumer video software that can run on your desktop. 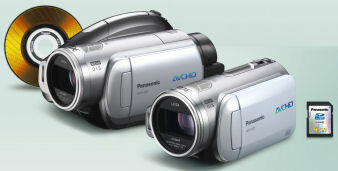 Camcorders are moving from tape to disc to memory cards, like the Panasonic HDC-DX1 DVD camcorder (back) compared to HDC-SD1 memory card camcorder (front). And new memory-card camcorders -- around the the size of a soda can -- also can shoot HD video. However, while today's computers can easily handle the demands of standard-definition video, the advent of HD places heavy demands on a standard computer. HD video is big -- some four times bigger than standard def -- so it takes more storage and bandwidth just to move clips around. And HD uses new video compression formats like HDV and AVCHD, which require more processing power even to display the frames, much less to edit your clips. As a result, consumer software applications again have to play catch-up with the new formats, new demands, and new hardware developments like multi-core processors. See my article -- HD on the Desktop: HDV and AVCHD: Consumer Software for HD Playback & Editing for more on HD camcorders with these new formats, and working with them using the newest generation of consumer video software for playback and editing. Video has never been more accessible for consumers -- and more confusing. It's even easier to use -- and harder to understand and master. It's all about "one-click" simplicity -- and an overwhelming profusion of options. If you're ready to dive into making own videos, there are two key questions: the type of camcorder to shoot with, and the video editing software to use to create your productions. Camcorders: There are four main options for digital video camcorders, as Mini-DV tape is augmented by 3-inch mini-DVD disc, hard disk drives (HDD), and solid-state memory (SDHC) -- as well as various combinations of the above. In particular, solid-state memory is coming on fast as almost the best of all worlds for camcorder storage, offering the instant-access convenience of hard disks, and the easy removability of tape and DVD. And today's higher-capacity formats can hold 80 minutes of high-definition video on an 8 GB card. Software: Meanwhile, today's consumer video editing software provides amazing capabilities at around a $100 price point -- importing a profusion of formats, real-time editing and effects, export to mobile and Web, and burning DVD and high-def formats. At the same time, these applications also package impressive technology for automating editing, clean-up, enhancement, and music creation. 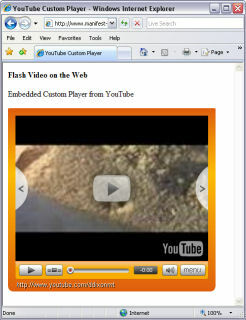 See my article -- Video Trends 2008: Mobile to High-Def for more on camcorder formats and video editing software. And for more on high-def camcorders with the new HD video formats, see HD on the Desktop: HDV and AVCHD: Consumer Software for HD Playback & Editing. and a 16 GB model for the iPhone. 32 GB $499, 16 GB $399, and 8 GB $299. 16 GB $499 and 8 GB $399. What can you do with 32 GB of storage? - Apple estimates you can carry up to 7,000 songs, 25,000 photos, or 40 hours of video. - SanDisk also has a new 32 GB version of its Sansa View for $349, which it estimates holds 48 two-hour movies or 8,000 songs (using different assumptions for compression formats. In three just years, flash memory has caught up to hard disk -- The original small media players based on flash memory like the original iPod shuffle from February 2005 had only 512 MB of memory (for $99), rated to hold a whopping 120 songs. And the original iPod from fall 2001 had only a 5 GB hard disk, which grew by early 2005 so the iPod Photo could make the jump from 40 to 60 GB (for $499 and $599). Also, as announced earlier, the iPod touch adds a $19.99 upgrade with several of the iPhone networked applications omitted from the first product: Mail, Maps, Stocks, Weather, and Notes. Corsair has expanded from its core focus on performance memory modules for high-end workstations and extreme gamers into products for more mainstream consumers. 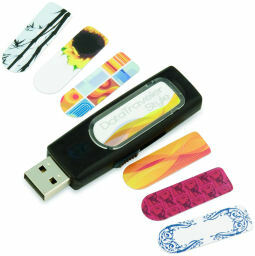 In particular, it offers some interesting options for rugged and secure flash USB drives, recently expanded to 32 GB. The durable Flash Voyager -- enclosed in an all-rubber housing -- is now available with 32 GB for $229. 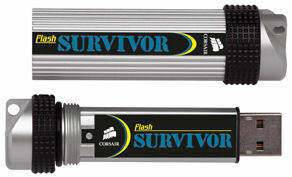 The rugged Flash Survivor -- with aluminum case, shock dampening collar and water resistant to 200M -- is now available with 32 GB for $249. 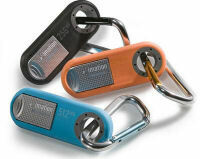 The Flash Padlock -- with hardware-secured lock and customizable PIN -- is available with 1, 2, and 4 GB, starting at $33. The SoundTech LightSnake audio cables are cool, and sensible. If you need to capture analog audio -- for example from a microphone, or a guitar or other instrument -- these are a "soundcard in a cable." Just plug one end into your analog audio source, and the other into a USB port on your computer, and the cable delivers digital audio, using its embedded analog-to-digital converter. The audio is CD quality -- 16 bit, 48 / 44.1 KHz sampling rate, with audio signal boost. The cable is 10 feet, shielded, and as a bonus the ends glow green when it is connected, and flash when data is being transferred. SoundTech has expanded its line of LightSnake cables -- there's an Instrument to USB Cable with 1/4" mono plug, a Microphone to USB Cable with XLR connector (though no phantom power draw from the USB port), plus MIDI, stereo RCA, and many more lighted cables. - The SoundTech Podcasting Kit, includes a high-quality professional microphone, tripod microphone desk stand, the LightSnake XLR Microphone Cable, and Sony Acid XMC software with 1-year Acidplanet Prozone membership -- for $129. - The SoundTech Vocal Trainer features Carry-A-Tune Technologies SingingCoach software to help singers of all levels to improve their abilities in the privacy of their own home. The kit also includes a professional microphone, tripod microphone desk stand, and the SoundTech LightSnake XLR Microphone cable -- for $89. SoundTech also announced the Ediface Digital Guitar Interface, a pick-up and converter that attaches directly to a guitar and promises to deliver digital MIDI data, targeted for "early 2008." See my Portable Audio Accessories Gallery for details and comparisons. I don't play the guitar, but I have to say that one of the coolest things at the recent CES conference was the Gibson Robot Guitar, which was demoed in a big tent out in front of the Convention Center. You can appreciate it simply as a clever product concept -- and as a very nice bit of engineering. No, the Robot Guitar doesn't play itself, or act as your virtual rodie. Instead, it tunes itself -- you press the control, and the tuning keys up at the top of the neck turn, by themselves, to adjust the tuning. This is obviously very useful to set up the guitar before a performance, and is an incredibly useful aid when changing strings. Guitar players also need to change the tuning for different songs in a set, so instead of swapping to a different guitar, they can select one of six presets (several user-defined), strum, and the guitar sets up to the new tuning in seconds. The engineering elegance comes from adding these components to a guitar without disrupting its feel or balance. Gibson started with a Les Paul guitar, added some small electronics in the back of the body, and one Master Control Knob on the front to select the tuning functions. The motorized tuners are constructed in a lightweight alloy housing, and are not any heavier than common tuning keys. But what about the wires? Did Gibson need to drill a hole up the neck to run wiring up to each of the tuners? Nah -- If you think about it, guitars already have wire strings. So the control signals, and the power, actually run up the strings to the keys! Gibson's limited edition first-run Robot Guitar shipped in December, for $2,499. Enjoy! See my Portable Audio Accessories Gallery for details. Portable storage is getting much more interesting, with USB "thumb" drives now reaching 8 and 16 GB, and even to 32 GB (see the Corsair line for around $229). The Kingson Technology line of USB drives includes USB memory card readers, some combined with a flash drive, plus the family of DataTraveler USB flash drives that span mini sizes to raw speed to fun styles (see previous posts). The DataTraveler Mini is a tiny drive that's not much bigger than a USB connector, and also includes Migo software to synchronize your personal workspace to run on public machines (1 GB around $12, to 4 GB $32). 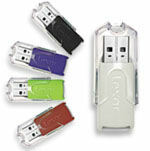 The DataTraveler Mini Fun is a colorful mini drive in stackable blocks (1 GB $12, to 4 GB $37). The new budget DataTraveler 110 drive has a capless design with a retractable USB connector (1 GB $12 to 8 GB $104). For faster data transfer, the new ultrafast DataTraveler HyperX has zippy 30 MB/sec. read and 20 MB/sec. write times (2 GB $74 to 8 GB $266). Or to keep track of your data, the new DataTraveler Style features side insert "skins" to identify and customize your drives (1 GB $19, to 8 GB $116). The Lexar Media line of JumpDrive USB flash drives also includes models focused on a variety of needs, including size, security, durability, and speed. Several drives also have an external capacity meter that displays the percentage utilization of the drive -- even when the drive is not plugged in. The small JumpDrive FireFly is available in stylish colors (256 MB $14, to 8 GB $149 list). The JumpDriveSecure II Plus includes security software and capacity meter (512 MB $24, to 8 GB $159). The premium JumpDrive products then include the Secure II security software, PowerToGo software to bring your Windows environment on your drive, and are Windows Vista compatible / enhanced for Windows ReadyBoost. The spiffy JumpDrive Mercury with a brushed metal look is rated at 15 MB/s read and 10 MB/s write speeds, with capacity meter (1 GB $34, 2 GB $59). The more compact JumpDrive 360 has a capless design with rotating metal jacket, and is rated at 15 MB/s read and 10 MB/s write speed (1 GB $34, 2 GB $59). And the zippy JumpDrive Lightning is rated at 30 MB/s read and 21 MB/s write speed (1 GB $39, to 8 GB $179). Apple has followed up on adding more storage for the high-end iPhone and iPod touch by also updating the small end of the iPod line. The iPod shuffle with 1 GB is now $49 (down from $79) , and there's a new 2 GB model for $69. This brings Apple's pricing closer to the range of competitive products from companies like Creative and SanDisk (though price really isn't the primary attraction of the iPod line...). 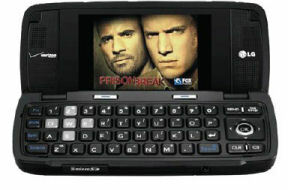 -- See my Portable Media Players Gallery for details and comparisons. In other news on USB flash drives, the Imation Clip and Pivot drives are designed for durability on the go, with tough casings and sturdy key rings to carry on backpacks, shoulder bags or belt loops. The Imation Clip is water resistant, and tucks the drive into a soft rubberized casing (around 2 GB $22, 4 GB $68). The Imation Pivot has a, yes, pivoting design -- The drive tucks in to the protective cap, and rotates out for use. In January, the line was extended to 8 GB, and added Windows Vista ReadyBoost compatibility (1 GB $29, to 8 GB $199). The new Imation Pivot Plus is the same design, with the addition of built-in hardware security -- 256-bit AES hardware encryption integrated into the drive controller to protect your data (1 GB $69, to 8 GB $249). The key point here is that the entire drive is protected -- You simply can't store unencrypted content on it. In fact, you can't even access the drive unless you enter the password. The drive actually is displayed in Windows Explorer as two drives: a read-only CD drive that contains the encryption software, and a second writable removable disk -- which is not mounted until it is unlocked. The Imation Encryption Manager Plus software on the drive launches automatically under Windows, and installs a driver that permits the drive to be accessed. You can set the drive up with a User password, or configure it in Corporate mode with an additional Administrator password to manage a collection of drives. With hardware encryption, all the content is always encrypted, so you need not worry as much when you (inevitably) lose a drive. Got some extra disk drives? As hard disks and optical drives grow quickly in storage capacity and transfer speed, it's becoming more common to swap out drives, including 3.5" hard drives for desktops, 2.5" laptop disks, and 5.25" optical CD/DVD drives. But whether you've swapped out a drive, or saved a drive from an old system, there's still the problem of how to access its contents, whether to extract some files or to reformat it before passing it on. 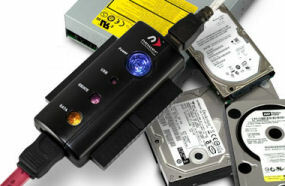 The NewerTech USB 2.0 Universal Drive Adapter provides a great solution. It's a kit that connects up to external drives to connect them though USB to a computer. Start with the adapter unit, and use the appropriate connectors and cables to connect it up to a variety of IDE, ATA, and SATA drives (including power). Then just hook it up to your computer like any other removable USB drive (with Windows 2000/XP, Mac OS 9.2 or higher, and Linux 2.4.X). The new version of the adapter adds connection status LEDs to indicate connection and disk activity (USB, IDE/ATA, SATA). It's available for around $29. Ultimate Ears develops custom molded professional ear monitors for professional / touring musicians around the world -- claiming an over 80% share of the professional ear monitor market. And the company has developed a range of products for the broader consumer enthusiast market, for users with a highly educated ear and discerning music taste. We tried out the Ultimate Ears Triple.fi 10 Pro personal earphones and were really impressed -- which should be expected with $399 earphones. These actually contain three individual speakers for each ear, with a crossover circuit that directs specific frequencies to dedicated speakers -- low-end for bass, mid-range for vocals, and high for treble. The result is a wonderful clarity in the sound -- so we can dinstinguish the components of the music -- the kick drum in a rock song, the high strings in an orchestral piece, even the squeak of the guitar string was more distinct in a softer Folk song. Even better, the clarity also seems to help separate the stereo field, so we really can hear a better stereo representation and interesting panning effects -- We can be convinced that we're inside the sound. 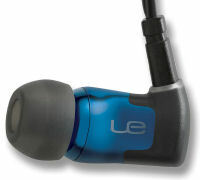 The earpieces also provide up to -26 dB passive noise isolation when properly inserted with the correct size ear tips. But Ultimate Ears carefully warns in the user guide that you should be careful to protect your hearing from loud volumes, and recommends not listening for more than an hour a day. The result is earphones that provide a clear and intense listening experience that is closer to good headphones or even studio monitors. We were able to hear details like compression artifacts in aggressively encoded MP3 files, and subtleties in a mix that we did not necessarily notice on other specific monitors. Entries posted to Manifest Tech Blog in February 2008, listed from oldest to newest.